Exciting news! 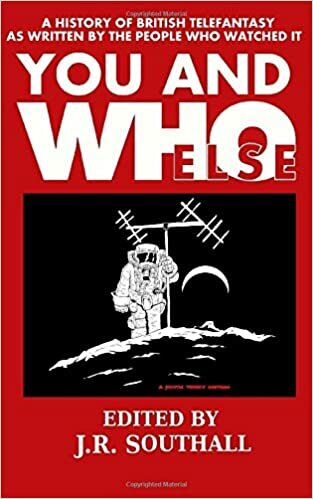 You and Who Else, a mammoth tribute to British telefantasy TV produced by Watching Books (edited by J. R. Southall) is now on sale! My own essay is just before the halfway point in the book and is about Blakes 7. The book also includes essays by Phil Ford (yes, that Phil Ford*), Keith Topping, Paul Castle, Jon Arnold, one of the editors of Blue Peter, and many, many more. *If you don’t know who Phil Ford is, then I suggest you look at the credits of TV programmes like New Captain Scarlet, Wizards vs. Aliens, and, oh, maybe Doctor Who. You can buy this tremendous book on Amazon.com by clicking here. Television is the route by which we map our lives. From the day we are old enough to understand words and pictures it is a constant companion, educating and entertaining us, helping us to understand the world around us – and firing our imaginations off into the far reaches of an infinitely varied universe. From Ace of Wands to Worzel Gummidge, from Randall & Hopkirk (Deceased) to Red Dwarf, from the moment Professor Quatermass’ rocket ship returned to Earth, to the moment Ian and Barbara entered the Doctor’s Ship, fantasy television has had an extraordinary effect on our emotions and our intellect. Whether it be exploring space or travelling through time, surviving the aftermath of some Earthbound disaster or creating new worlds in uncharted territories, the writers and producers of speculative television have used the format to reflect and inform the world in which we live. And whether it be through horror, science fiction or imaginative fantasy – or a combination of all three – we have all been touched in some way by the creativity and insight provided by such visionaries as Gerry Anderson, Nigel Kneale and Douglas Adams. You and Who Else is a unique history of sixty years of British fantasy television, and a definitive record of its place in our lives – as told by the people who saw it: the viewers. All royalties from this volume will be donated to the Terrence Higgins Trust. See: http://watchingbooks.weebly.com/ for more. Like it says, all proceeds go to the Terrence Higgins Trust. I cannot recommend this book highly enough. I just finished reading it and it is wonderful! ← Another Book Nears Completion!